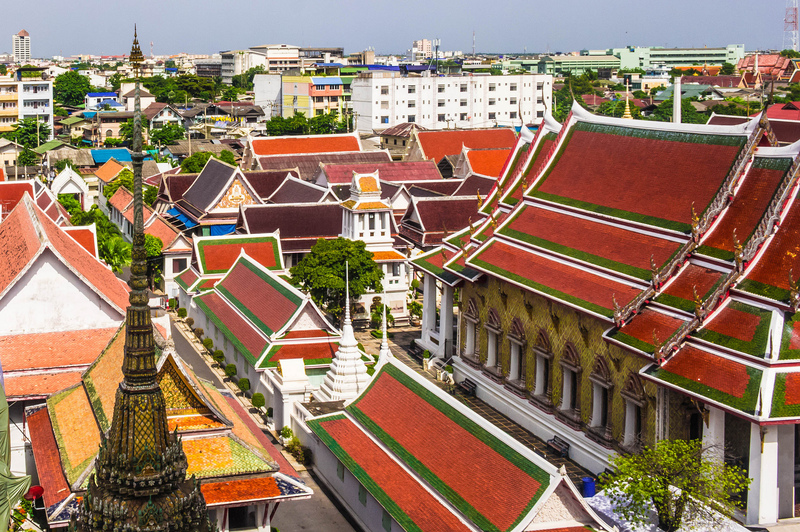 The sophisticated palaces and colorful neighborhoods make Thailand an ideal example of Southeast Asian culture. Approaching the Gulf of Thailand on the last part of the road where the Chao Phraya River flows between rice fields, mango arbor fields and beautiful plantations. After this, less than 35 km from the sea, at the turn of the river there are beautiful sacred altars with spiky towers and golden roofs and at the same time big skyscrapers and hotels. 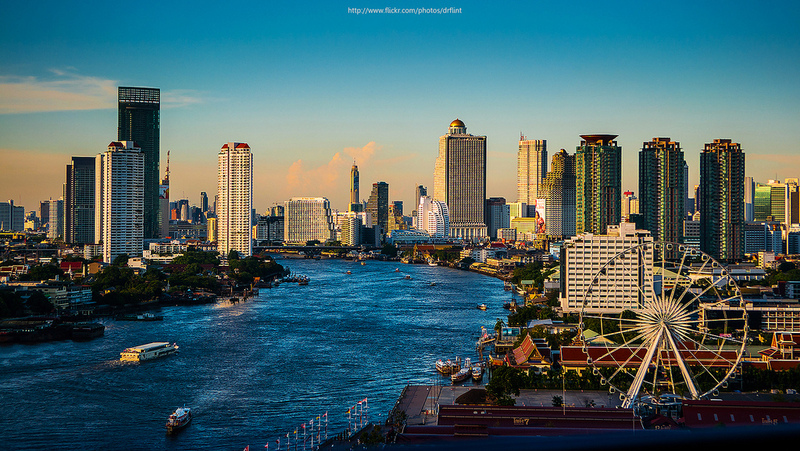 It is the capital of Thailand with a population of 7 million, Krung Thep ( The city of Angels in Thai Language). Its history starts with the killing of a tyrant. After the destruction of the the former capital of Ayutthaya, by the Burmese army in 1767, defeated Thai general Taksin was proclaimed as king and established a residence in a village near the western bank of Chao Phraya River. But the king eventually got mad, believing himself to be the reincarnation of Buddha and terrorizing the servants. In the palace there was a rebellion and the demented King was killed by his officers. The throne was occupied by a general called Chakri, who was part of the conspiracy. Under the name of Rama I, the new king founded the Chakri Dynasty, which dominated through the centuries up to now; its current monarch of the dynasty, king Bhumibol being its current heir of the dynasty. Rama I moved his residence from the place of the crime to avoid evil spirits to the eastern bank of Chao Phraya River, establishing little Bangkok, which in time has become the capital of Thailand. Under the rule of Rama I and his descendants, many structures were built like magnificent palaces, throne halls and immense Buddhist temples while some parts of the palaces are still accommodate the actual royal family. The exceptions are the temples and some palaces, which are open to the public. One of the oldest buildings of the complex is the Grand Palace, built in 1783 and guards a black throne. At the green and golden background of the walls of the throne hall, there are paintings with angels coming out from lotus flowers, a possible reason why the city is called “The city of Angels”. A part of the palace dates back to the first Chakri era. There is a golden throne called Busabok Mala which has the form of a boat. 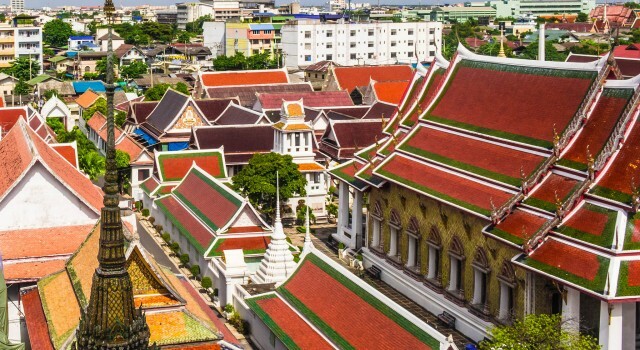 Among the four Palaces, the Grand Palace is the most imposing, being constructed by British architects in 1876 with a Renaissance style castle with Thai pediment from which green sacred snakes are coming out. The monastery complex Wat Phra Keaw is one of the most beautiful creations of all times. It was created by Thai architects. A rectangular hall, surrounded by golden altars and sculptures representing animals, gives home to one of the most important symbols of Thailand “The Emerald Buddha”. A 10 meter high structure, the legend says that it was created by deities, being the protector god of the Chakri Dynasty. The faithful of Bangkok, however, prefer another statue, the “Stretching which is 14 meter high and has a length of 24 meters. Situated at the Wat Po monastery, the enormous sculpture is covered in numerous golden plates which the locals have attached to it during the course of history. 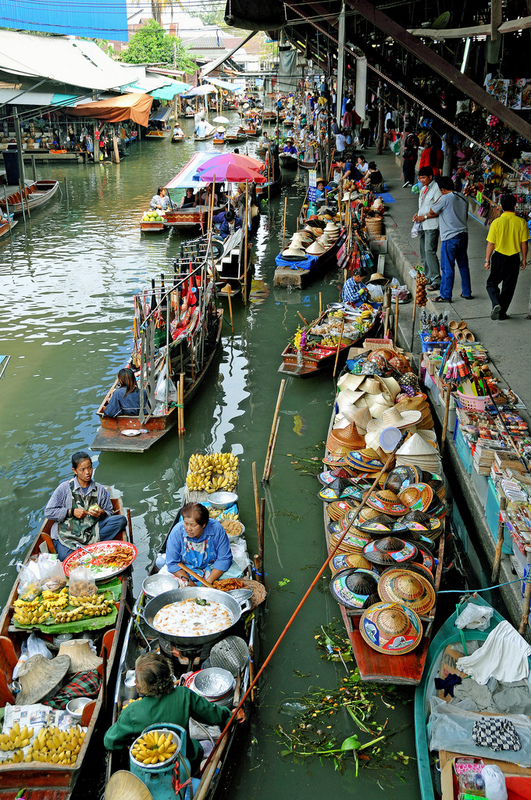 The most colorful part of the city at the west side of the river bank is Khlong. It is a labyrinth of canals with little river flows where “the rivers people” live for a long time. These people live in houses built on pillars. Canoes are extremely common here, being an example of Asian tradition. These are used to carry supplies to markets where local business is flourishing. The image of the whole Khlong is senzational. Tourists are intrigued by the shows that the city also includes traditional Thai dancing shows or walk and enjoy recreations that Bangkok can offer. In the City of Angels visitors come from all around the world thanks to for its beautiful Thai ladies.